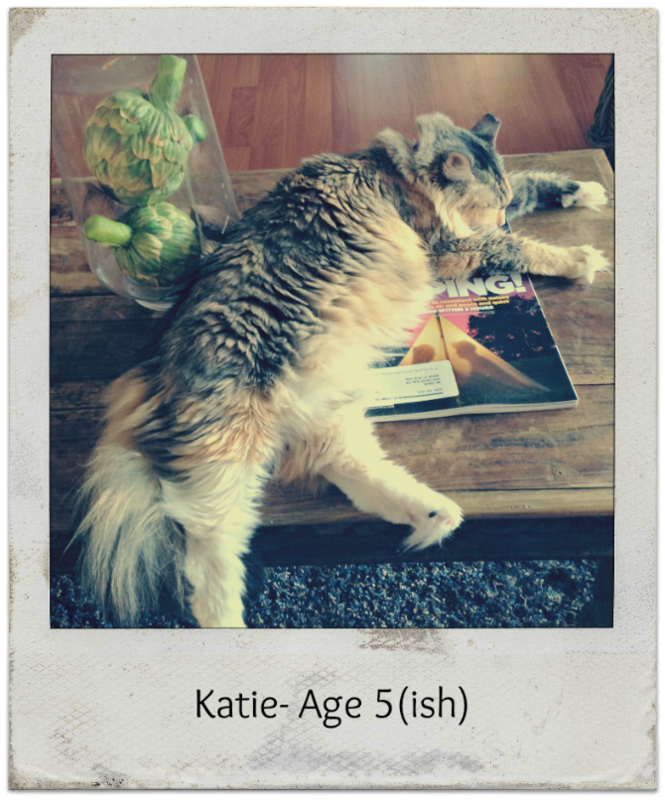 Katie was an unplanned pet. 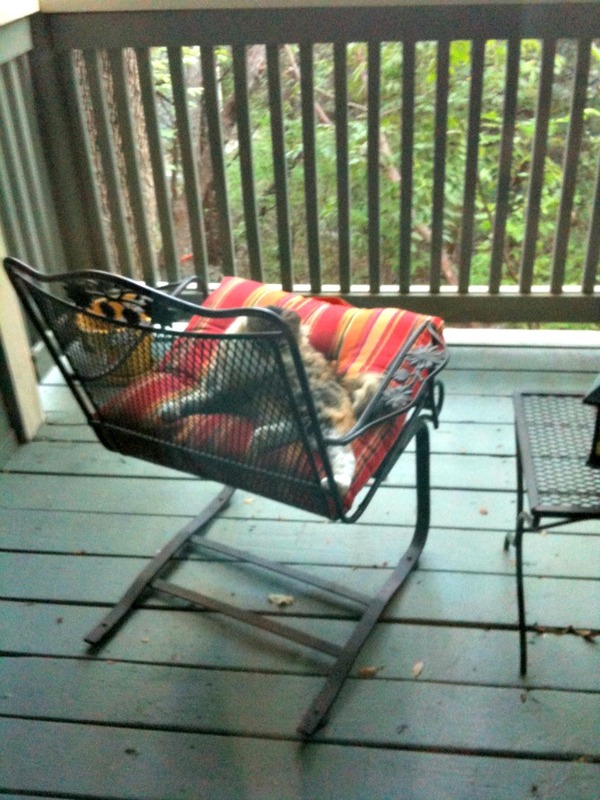 Bailey and I were doing just fine on our own, until one fall day I came home to find this fluffy thing had made herself comfy on the back deck. Having no idea if she belonged to anyone, I put some food out for her. (sucker!) Of course she continued to come back- climbing up a tree to reach my balcony and settling in on one of the chairs. It took a few weeks for her to feel comfortable around me, but eventually she let me come outside and sit with her. I had determined that she was one of the many feral cats in the neighborhood, and that it wouldn't hurt to at least make sure she had food and water. Fall turned to winter, and when it actually got cold enough I started to feel sorry for the cat. I had just been calling her "kitty cat", and somehow kitty turned to Katie, and that's when I knew I was toast. 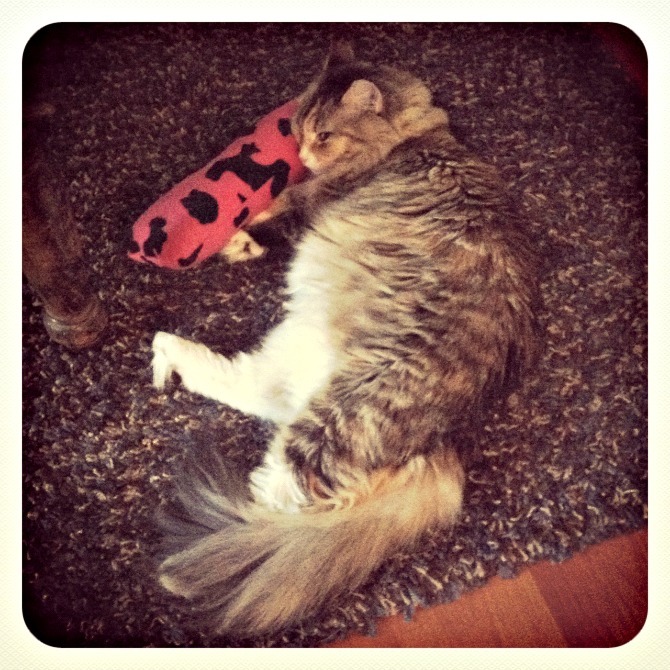 Katie got to come inside one particularly cold night, and that was pretty much the end of her life as a feral. 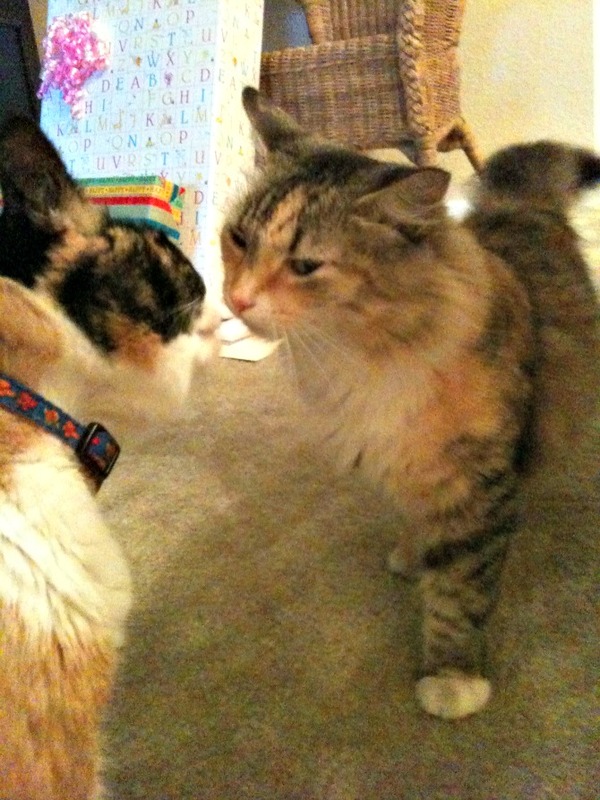 Luckily Bailey has always been really mellow, and didn't seem to mind the intruder. 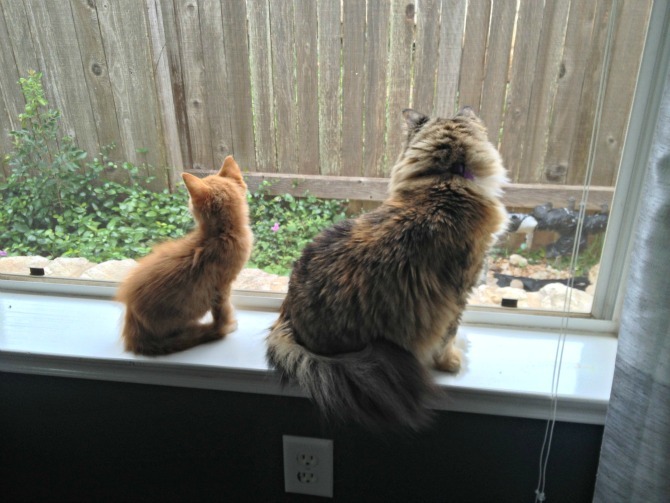 They had a peaceful first meeting, and have been co-existing ever since. 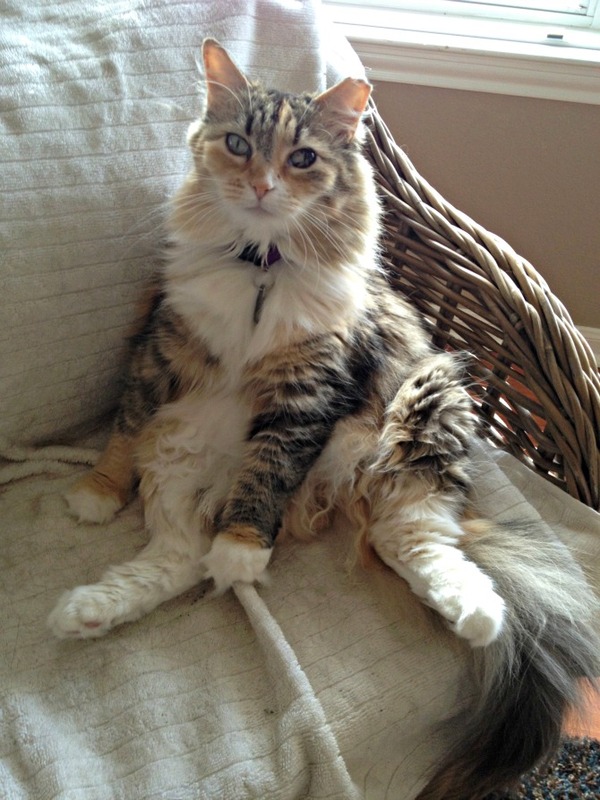 Katie is your typical cat, with maybe a few funny quirks here and there. She was not the most affectionate cat at first, and was happier laying somewhere in my general vicinity. For awhile I would just let her in at night, and she would typically find her way to my feet and snuggle. During the day I would let her out to roam around. But I began to worry about traffic and wild animals, and thought it would be safer to have her indoors all the time. She made the transition just fine, and now doesn't even think twice about wanting to go out. When I made the decision to move into Hank's house, I was a little worried about how she would do with dogs. While her confidence had grown tremendously, I didn't want two small dogs to bring that crashing down. Katie held her own though, and quickly found her own spots around the house for lounging. When not being lazy (and sitting in such ladylike positions), she likes to play her games on my iPad. 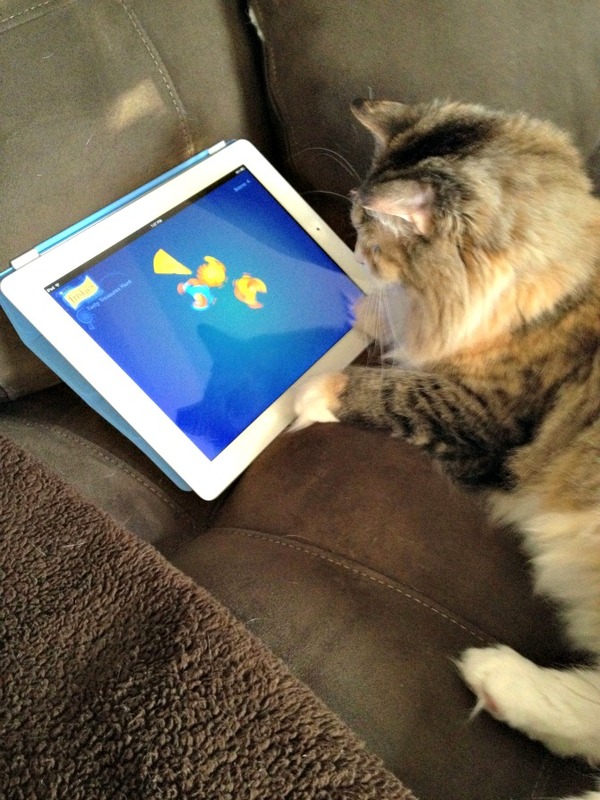 Yes, I have cat games on my iPad- I am officially "that" kind of cat lady. Even if it's not one of her games, she swipes her paw against the screen and totally interrupts anything I might be doing on it. I draw the line at getting her own to play with. For as independent as she often is, I was really taken back when I brought home two foster kittens, Bernard and Bess. I honestly thought Bailey would be the one with the most motherly instincts, but I was wrong. Katie took the most interest in the kittens, especially little Bernard the orange tabby. She would let him crawl all over her and snuggle, and would often go into the office to check on them. It was such a cute thing to watch. And since then, she has grown even more comfortable in our home, joining us on the couch, or always being somewhere close by. For a cat who wasn't really "planned", I'm glad to have her as part of our herd.